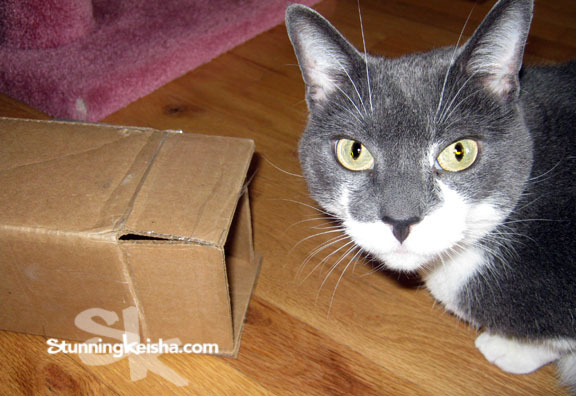 Stunning Keisha: Can The Cat Fit in The Box? Disclosure: we paid for the contents of this box and this isn’t a review. I received a box full of fabulous peacock feathers that we ordered from Nip and Bones today. 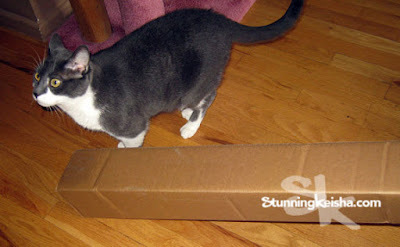 After I had a play session with the feathers, TW let me smell the 4” x 4" box. I scoped it out to see if I’d fit in it. TW laughed. CK: You don’t think I’d fit in there, do you? I stuck my head in and then my front section disappeared at which point TW freaked. She was scared I’d get in but wouldn’t be able to turn around to get out so she pulled the box away from me. Damn! I bet I’d have make it all the way in. Let’s hear from you, kitties. Would you have tried to crawl in this box and do you think you would have fit? I know I would have. Katie would have eaten the corners of the box. Waffles would have wedged his way in. And would still be stuck. haha! Enjoy those fabulous peacock feathers, CK! With such a beautiful elegant body as yours, of course you would have fit in. I don't think I would though. We're cats....we can fit in ANY box!! Sure you would fit CK! nInwould so be right in there! None of us would have tried it, but I bet two out of three of us would totally fit! (Boodie being the exception.) Whether my human would have to rip the box open with her bare hands to get us out is another story. Of course you would have fit! We'd probably be right in there with you. I know you would've fit. I woulda tried. CK, we think you woulda tried really hard, but we don't think you woulda fit...or woulda given up before you actually found out. We think you could fit, if you wanted to, CK! You could totally have made it in there. TW is such a spoilsport. Of course we would try, but don't think we'd be too successful! Bet Maru could! We love boxes... all sizes! OH yes ... heck yes we'd have crawled in!!! We would have DEFINITELY tried! There's no box a kitty can't conquer! We think you would have fit too, CK! I know you would have fit. My chubby cats would not, especially 20 pound Sammy. Penny is trim, she could. 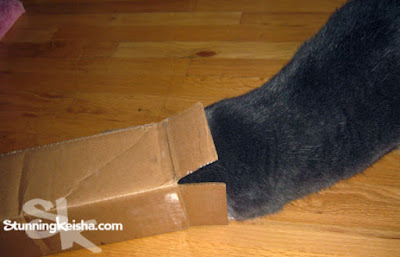 You would have partly fit, and that's enough reason for a cat to try.